Resistance is a major obstacle in all cancer treatments. Inexorably, most treatments end in treatment failure due to cancer cells becoming resistant to treatment with disease progression as a result. Finding ways to prevent or reverse resistance is a very large unmet medical need and blocking resistance mechanisms could have a large clinical impact. Inhibition of STAT3 may be a novel and highly promising treatment strategy for patients with advanced prostate cancer and CRPC. Prostate cancer is estimated to have the largest incidence of any cancer by 2024 becoming the most common cancer in the western world, affecting hundreds of thousands of men every year. It ranks second in cancer-related deaths, with the vast majority of these fatalities resulting from metastatic disease each year. Androgen deprivation is the mainstay of therapy for advanced PCa cancer and leads to PSA responses and clinical improvements in >90% of patients. Other treatment options that increase survival are taxanes, sipuleucel-T and hormonal agents, e.g. antiandrogens such as abiraterone acetate and enzalutamide. However, none of these treatments is curative. Metastatic castration-resistant prostate cancer (mCRPC) is the final stage of prostate cancer and remains lethal. There is currently no effective treatment for this stage of the disease and the effect on prolonging the patient’s life is, unfortunately, very limited. Glactone Pharma is developing a new treatment paradigm with a drug for this particular stage of the disease to address this huge unmet medical need. There are several challenges in the treatment of CRPC. Clinical resistance to the second-generation antiandrogens in CRPC is a large unmet medical need. 15% to 25% of patients with CRPC do not respond to first-line treatment with either abiraterone or enzalutamide. Of the 75% to 85% of patients that do respond to initial treatment, subsequent PSA increase or tumor progression almost always occurs. In the first-line CRPC setting, resistance typically develops after 9 to 15 months of treatment. Few treatment options remain at this stage. In antiandrogen resistant mCRPC, development of neuroendocrine prostate cancer can occur which is associated with poor survival. Studies by us and others have shown that constitutively active STAT3 can confer anti-androgen (enzalutamide) resistance. 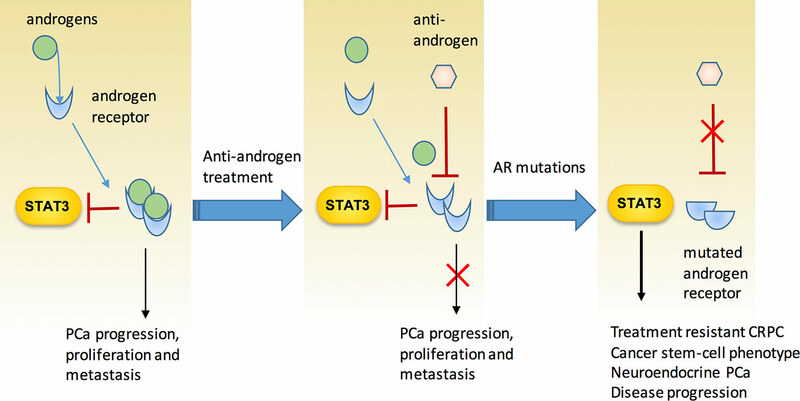 The likely mechanism is that effective AR inhibition and androgen depletion induces STAT3 activation which acts as a bypass pathway of androgen dependence, driving proliferation and metastasis. Figure: Glactone Pharma’s STAT3 inhibitors are effective in multiple prostate cancer models, including Inhibition of proliferation of enzalutamide resistant PCa cells in vitro and in vivo. In addition to treatment resistance to antiandrogens in CRPC, STAT3 has also been shown to be a key mechanism to resistance of EGFR inhibition in non-small cell lung cancer (NSCLC) and to resistance of BRAF and MEK inhibition in melanoma.